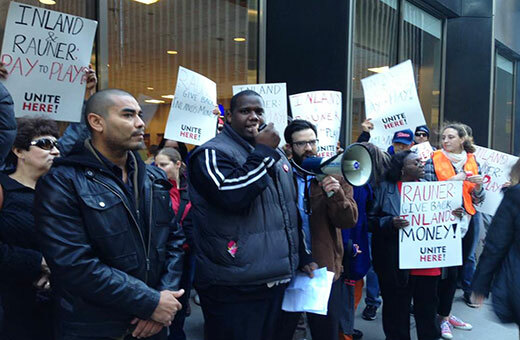 Chicago hotel workers to Bruce Rauner: Give back the money! CHICAGO – Hotel workers in America’s “Second City” descended on Republican gubernatorial candidate Bruce Rauner’s campaign headquarters here yesterday demanding that Rauner return $25,000 he got from a real estate firm that holds more than $200,000 in state contracts. Rauner has made stopping what he calls the “chokehold” that special interests have on Illinois state government a key part of his campaign to unseat Democratic Gov. Pat Quinn. The demonstration at his headquarters yesterday, coming as it did on top of the new information about the $25,000 contribution from Inland Real Estate Group, is casting doubt on the right-wing Republican’s commitment to ethics reform. “Bruce Rauner said he wants to stop the chokehold that special interests have on our government, but Inland’s contribution may well be just more of the same,” said Demetrius Jackson who has worked at the Hyatt Regency Hotel here for seven years. The 50 to, at times, 100 hotel workers who jammed the entrance yesterday to the building at 230 W. Monroe which houses Rauner’s election headquarters let loose with chants that echoed through the cavernous streets of the West Loop. Their shouts of “Pay to play, not okay,” “Rauner’s game, more of the same,” and “Hey Bruce, give it back” could be heard several blocks away. The demonstration was targeted at what the hotel workers say are serious ethics violations, not at the broad range of anti-union and anti-minimum wage hike postions Rauner has taken over the years. Nevertheless the demonstration showed, perhaps better than anything else, why Republicans are often so determined to destroy unions. Workers with the most involvement in unions and union organizing were among the most vocal in yesterday’s protests. The Inland Real Estate group which gave the money to the Rauner campaign owns much of Chicago’s and the nation’s hotel space. The connections in this case that seem to make the case for an ethics problem are as follows: Rauner accepted the $25,000 contribution from the Inland Real Estate Group, a $16 billion company headquartered in Oak Brook, Ill. The company’s affiliate, Inland Commercial Property Management, holds a contract with the Illinois Department of Central Management Services worth over $200,000. 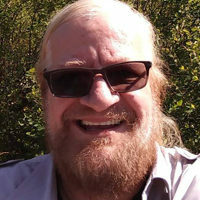 The contribution is seen by the union as a way of getting around Illinois law which bans campaign contributions from companies that have or are seeking state contracts. The loophole the Rauner contribution uses is that the law does not cover the sister companies of those entities. The Inland Real Estate Group and its chairman are both tied to Inland Commercial, owning 12.5 percent and 10 percent of the company respectively. Inland’s chairman is the former board chair and a current director of Inland Commercial’s sole owner and is also chairman, president and majority owner of the Inland Real Estate Group’s sole owner. Another affiliate of the Inland Real Estate Group, Inland American Real Estate Trust, was under investigation by the Securities and Exchange Commission (SEC) as of June 30, 2014. Rauner is not the only politician who has taken contributions from Inland affiliates. The Inland Real Estate Group contributed $15,000 to Republican Illinois Treasurer candidate Tom Cross as its affiliate Pan American Bank held a contract with the Treasurer’s office worth over $100,000. Current Illinois Treasurer Dan Rutherford has also received $12,500 in donations from companies related to Inland from April 29, 2005 to August 22, 2012.